Profitez de cet incroyable chalet de style Beach House à seulement quelques pas de l'océan. La maison est située dans un parc comme le cadre avec la plage si près que vous entendez les vagues se briser. Currimundi est un village de front de mer idyllique, situé sur la pittoresque Sunshine Coast. - 50 marches de la plage à la porte d'entrée. -100m du lac Currimundi, parfait pour les enfants, les planches de paddle, le kayak, la pêche et les châteaux de sable! Beach House Currimundi peut accueillir 14 personnes. - Cuisine entièrement fonctionnelle avec four, cuisinière, micro-ondes, lave-vaisselle. - Buanderie complète, y compris lave-linge, sèche-linge, ligne de lavage à l'extérieur et des lignes dans le garage. Beach House Currimundi est parfait pour les familles grandes ou petites, vous offrant tout le luxe de la vie privée et de l'espace dans un lieu unique. La plage de Currimundi est une destination populaire pour le surf, le kitesurf, la pêche, la plongée sous-marine et le surf paddle. Le lac Currimundi est très amusant pour les enfants et les adultes de tous âges, la natation, le kayak, le paddle board et la pêche. - 100m des cafés de plage avec vue sur l'océan et le lac. Les meilleurs petits déjeuners, déjeuners succulents et super café! Il ya beaucoup d'attractions de classe mondiale très proches, y compris le zoo d'Australie, Underwater World, la belle Sunshine Coast Hinterland, excursions d'une journée à l'île Fraser et bien plus encore. 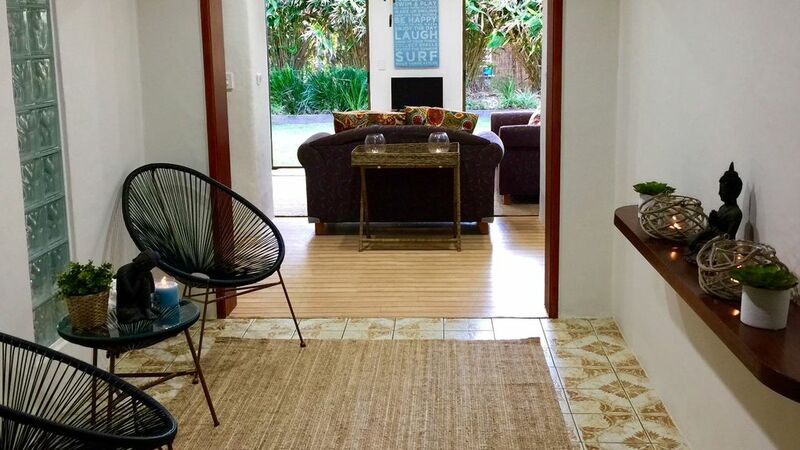 Que vous recherchiez des vacances paisibles pour vous reposer sur la plage ou des vacances plus actives en profitant de tous les sites et des plaisirs de cette partie glorieuse de la Sunshine Coast, le Beach House Currimundi est votre choix idéal. Beach House Currimundi, et son emplacement unique est vraiment idyllique. C'est l'hébergement de style chalet avec plusieurs espaces de vie, salles de bains et chambres à coucher signifie que tout le monde reste a l'espace et la vie privée. Détendez-vous et profitez d'une maison de plage et d'un emplacement pas comme les autres. Veuillez noter que les couvertures et les oreillers sont fournis et que vous devrez apporter votre propre linge. (serviettes de bain et de plage, draps, taies d'oreiller, tapis de bain, essuie-mains et torchons) Si vous avez besoin de location de linge s'il vous plaît demander comme nous serions ravis de vous aider. Les termes et conditions sont strictement respectés. La maison ne convient pas pour les fêtes, les camarades ou les grands rassemblements. Seules les personnes inscrites peuvent séjourner dans ou sur la propriété. Ces conditions sont strictement appliquées. L'expulsion se produira sans remboursement si elles sont violées. S'il vous plaît contacter le propriétaire pour plus de détails de l'occupation. We stayed here for a week with another family of 5 and had the best time ever. The house has plenty of seperate living areas for everyone to escape to their own space. The kitchen is extremely well equipped with anything you’d need. The beautiful reserve beside the house is perfect for catching some sun or shade whilst reading a book or playing with the kids. You are literally a minutes walk to the sand and the path along the front is great for riding bikes or enjoying a walk. Karen was a fantastic host giving us great tips on places to eat. We will definitely be back and highly recommend anyone wanting to stay here. Thank you Kellie for your kind words. It makes us so happy that you all had such a lovely time and enjoyed all that Beach House Currimundi has to offer. We really look forward to seeing you again. Kindest Regards, Karen. A large and well equipped beach house! Karen was intent on making our stay an excellent one and it was. The house was well equipped, accommodated all 3 families easily, communication was excellent and the kids particularly enjoyed the great shady yard plus the separate tv area. The Christmas decorations and the outside fireplace were an extra touch that were appreciated. We did, however, miss a larger freezer down the bottom fridge in the kitchen but there was an excellent fridge freezer in the garage. Thank you Lois, I'm so pleased you enjoyed your stay. Yes, we agree the freezer could be bigger but unfortunately thats the only size that would fit the space. I'm pleased you made good use of the extra large fridge/freezer in the garage. Sea Lake is such a special place I am so happy you enjoyed your stay and have made some wonderful family memories to cherish forever. Please come back soon. Kindest Regards, Karen. We really enjoyed our stay at Sealakes Beach house. A wonderful family celebration, lots of space, we didn't want for anything, great attention to detail, lovely surrounds, peaceful and relaxing environment. Gierke Family. Thank you for your lovely review. It makes us so happy that you all had a wonderful time together. Thank you for staying and we hope to see you again soon. Kindest Regards, Karen. We could have asked for anything more - this house has space, enough beds, blankets, the kitchen is fully equipped (even for baking cakes!! ), location, walks, beaches. We had 2/3 families staying here and had a wonderful stay. Karen, went above and beyond to accommodate our every need. This will become our new home from home when we are next on the Sunshine Coast. Thank you for your lovely review. I'm so pleased you all had a marvellous time at Sea Lake! It is a very special place and we are so pleased you all enjoyed your stay. Please visit us again! This house was exactly what we needed for our 4 might stay. There were 10 of us girls and there were of different living spaces and a big table we could gather around at night for meals. Thank you Heather, It makes us so happy you all enjoyed your stay at Sea Lake. We think its a really special place and we are so pleased to share it with you and your friends. Kindest Regards,Karen. We had a great stay in a secluded place which was very close to beach, walks, lake and shops. The house is very well appointed with everything you need for a get away with family and friends Our Grandchildren had a wonderful time playing in the well kept yard. Our family and friends were also impressed with the quality and size of the house.